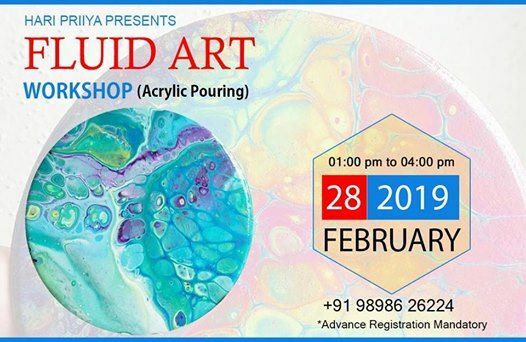 ?Fluid Art (Acrylic Pouring) Workshop? Fluid painting is Fun Technique to do with paint Colors in which you make Painting without Any kind of Brushes. Here we Use Different method of Pouring on Surface of Article and with Hand movements, You Create Beautiful Painting. 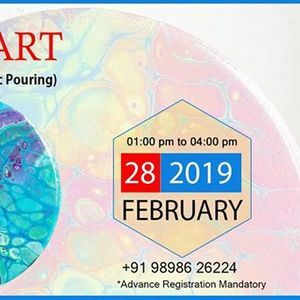 - You will learn different pouring techniques with help of acrylic Colours using pouring medium. - The Painting is done with totally unexpected beautiful designs in the end. - All the materials provided by us. - You will get hands-on experience on canvas and 2 tea coasters.
? What to bring - Apron and old newspaper.